Waking up to find water seeping up through the carpet of her finished basement was the last thing Terry Horne wanted just six months after moving into her new home with her wife. The first-time homeowners had no idea when they bought their house near Cheney in 2016 that it might end up inundated with water. But after checking with others in the neighborhood, which sits north of the Fairways Golf Course, it became clear that it is a common problem in the area. They'd later come to find out that county officials had known about drainage issues there for at least a decade. Horne, who bought the home with a Veterans Affairs home loan, says she felt blindsided. No one, from the previous owner to her inspector or appraiser, had caught or disclosed that the home might have water issues, or that it was in what the county considers a "high risk drainage area." "You can never prepare yourself as a homeowner for this," Horne says. "How come I was never disclosed this?" Her home's sump pump, she noticed, pumped water from a pit in the ground just behind her home, through a shallow pipe that cuts right through the sidewalk curb, where it spews into the street. Most of her neighbors also have pumps that do the same, all to keep the water away from crawl spaces and basements, but because the land is so flat, it pools in the road, sitting stagnant in warm weather, and turning the whole block into an ice rink when it's cold. So Horne started digging into public documents, at first in an attempt to find a remedy for her own situation. 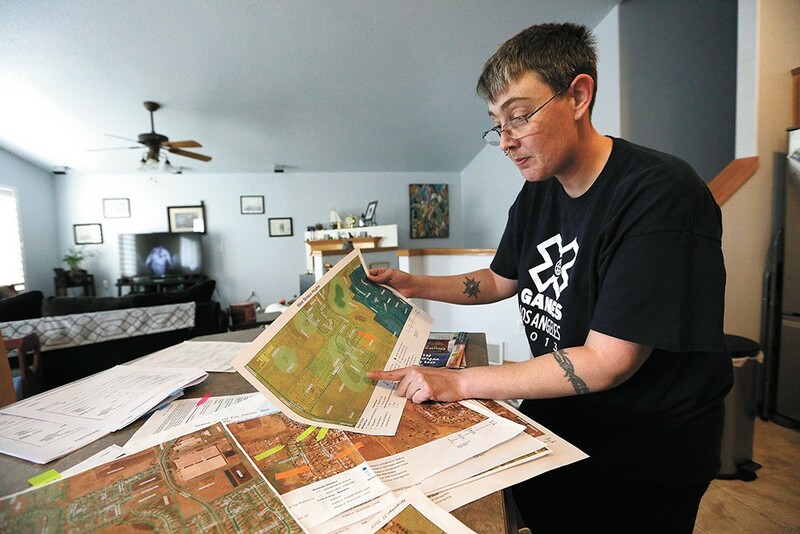 It quickly became a full-time passion, and a year into the research, Horne believes the home designs should never have been approved in an area known to have wetlands and a high water table without proper drainage in place. Now she wants Spokane County to solve the problem for everyone. "You know there's already a problem with how water gets drained around here, and yet you still allowed a basement to be built in this area?" Horne says of the county's signing off on the building permits. "They have an opportunity to come in here and do what is right." But the county argues that while the water is causing issues in the public right of way and putting a higher demand on its winter crews, the homeowners will have to shoulder the costs of the most likely solution, which would be to connect their sump pumps to a drainage pipe leading into the county stormwater system. "The county, as much as anybody, wants a solution, because it's prematurely destroying the road, and that's expensive to replace," says Matt Zarecor, Spokane County stormwater utility manager. "It's just who is going to participate, to what degree, and what will that solution look like." Mostly, the question is who should foot the bill. It's been 15 years or more since the homes were built, and the phone numbers for various builders connected with the early phases of the neighborhood have been disconnected. Richard Boyden, who helped do the early land study and plat for the development, says he wasn't involved in any of the building and he hasn't heard anything about the site since selling the land. As for the county, there are limited resources for maintaining any roads, let alone local access roads, Zarecor says. "We can't do it just as the county for a few reasons," he says. "One is the financing: who benefits? Just them, really. Often we'll do the financing and everything, but we do expect the neighborhood to participate in that financially." Terry Horne looks at a map showing a wetland in her neighborhood. The homes on Horne's street were built over the course of a few years, mostly in 2003 and 2004, nearly a decade after early plans to develop the area were submitted to Spokane County. Monitoring of test pits dug in the area in the mid-'90s showed that groundwater was encountered as close to the surface as 2.7 feet down, and hard-to-infiltrate clay was noted in the soil makeup. In part because that geotechnical engineering work showed high groundwater levels, the Spokane County Hearing Examiner decided in 1996 that the area was not suitable for basements, and if builders wanted to put them in, they'd have to ensure the drainage systems in that area were designed to handle extra water from sump pumps. It wasn't until after the first homeowners noticed water coming into their crawl spaces and basements that the builder installed the pumps, and even then, they didn't install a system to get the water to the ponds. For homes like Horne's, the nearest stormwater drain is more than 500 feet away, so the water just gets pushed onto the flat road in front of her house, where it pools and runs back toward her outlet pipe. Among the first to build in the neighborhood was Ken Chapman, whose home went up in 2003. Soon after, the retired veteran learned a neighbor was having issues with water, and he quickly bought a pump to keep water out of his own basement. Like Horne and others who moved to the neighborhood well before her, Chapman had no idea drainage might be an issue before building there. "I come in from Iceland, built my house and boom I've got a flood problem. That's not what I was looking for," Chapman says. "I would've built a cabin in the woods or something." Part of the problem is that in 1999, the county tried to prevent basements from being built in areas where water would be an issue, unless an engineer signed off saying it would be OK first, but the courts threw the rule out (largely for procedural reasons), Zarecor explains. The county was eventually able to put more restrictions on building basements in high-risk areas, but that was after these homes in the West Plains area went up. When the homes were only a year old, residents started calling the county to report their basements and crawl spaces were filling with water and their foundations were cracking, according to complaints made to Spokane County Public Works in 2004. Many went to their builder, and sump pumps were soon installed in certain homes, but instead of tying the water discharge into the stormwater system, the pipes were routed through shallow ground (which makes them susceptible to freezing in the winter) to the edge of the sidewalk, where they spit the water right into the street. The water in the road is so bad, Chapman says he "got a daggum John Deere tractor," to break up the ice dams that form whenever the county plows the road. He and his wife can't get in or out of their driveway otherwise. Their house is near one of the only storm drains on the street. When Zarecor was working for public works' development services division, he learned that the homes were discharging water into the road, which was never county approved. "They didn't ask, they just went and did it," Zarecor says. "They put in sump pumps and punched a hole in the curb." He asked his boss what the county should do, but after realizing that if they required the owners to shut off the pumps that the properties would certainly flood, they decided they'd have to let it be. "He shrugged his shoulders and goes, 'I guess you let it go,'" Zarecor says. "We could go cut them off and tell them no, but there's no good answer for these folks. We know if it won't go in the ground, there aren't any options." While the owners have continued to pump water into their street, just down the road, more homes have gone in, and while some have been hooked into the storm system as they should, others, like Kayla Brooke's, haven't. Brooke and her husband had their home built in August 2010, and lived there for two years before realizing they had had multiple feet of water sitting in their crawl space. "We had a newborn, we were terrified of getting mold," Brooke says, so they went to their builder to demand a fix. The company, Copper Basin, gave them a sump pump, but after running nonstop for a month, it broke. They got another, and that one broke too. Finally, the fix was to give them two pumps to constantly cycle water out of the space. Now they're looking at a $12,000 price tag to actually fix their problem in a way that's not just "throwing a Band-Aid on it," Brooke says. "This story is not unique," says Jessica Berwick, who lives on another street near one of the drainage ponds. "There are many houses with multiple sumps." Zarecor has suggested Horne gather support among her neighbors to have a meeting with the county to talk about options. Until there's a sense of how many might participate, the county won't be able to estimate the cost to tie into its system. The county also would need easements to install the connections, and contracts for who ultimately would maintain the pipes once they're in place. "That sort of thing would take the bulk of the neighborhood to be interested," Zarecor says. For her part, Horne continues to hunt down documents and hopes to take the issue to the county commissioners. She has also asked a lawyer to find out if there is potential for a class action lawsuit, if it were to come to that. Her dedication, bordering on obsession, has earned her a nickname among some neighbors: Terry "Brockovich," after the legal clerk who was instrumental in building a case against a natural gas company that polluted groundwater in California. "The issue they're having is who is going to pay for it, and we're not going to," Horne says. "You failed us from the beginning. Where was your building inspector? You finalized this plat and let these builders walk out of here. How dare you put this on us."